Turn Thanksgiving leftovers into a delicious turkey pot pie with carrots, parsnips, peas and a delicious and easy puff pastry crust. For the first time ever, I was away for Thanksgiving. We’ve always done the big holidays at home–I’ve never been away for Thanksgiving or Christmas. But I want to focus on Thanksgiving because I just love everything about celebrating it in Toronto. The chill in the air, the smells that takeover the house, the leaves changing colour, those festive (and slightly cliche) table settings with funky gourds, and of course all of our Thanksgiving traditions. And obviously the food, but that’s a given. This year, the timing just worked out for me to take a little vacation right around Thanksgiving. It’s my first full week off in about a year and a half. Which is way too long. This is something I have to do a better job of prioritizing going forward. Having time off to relax, even just to stay in Toronto, or to travel and explore a new place is so good for you. I finally feel refreshed and I feel like I can create again, which is pretty important for someone who does this blogging and recipe developing thing. Pro-tip, don’t go that long without a week off, ever. My turkey pot pie (or you could use chicken and make a chicken pot pie) is a little bit different from your classic pot pie recipe. I use a combination of onion, carrots, parsnips and peas for the filling–no celery here! I actually am not the biggest fan of cooked celery, and I think the sweetness from the parsnips really take this pot pie to the next level. I worked on this recipe for a while to get the perfect creamy consistency for the filling. 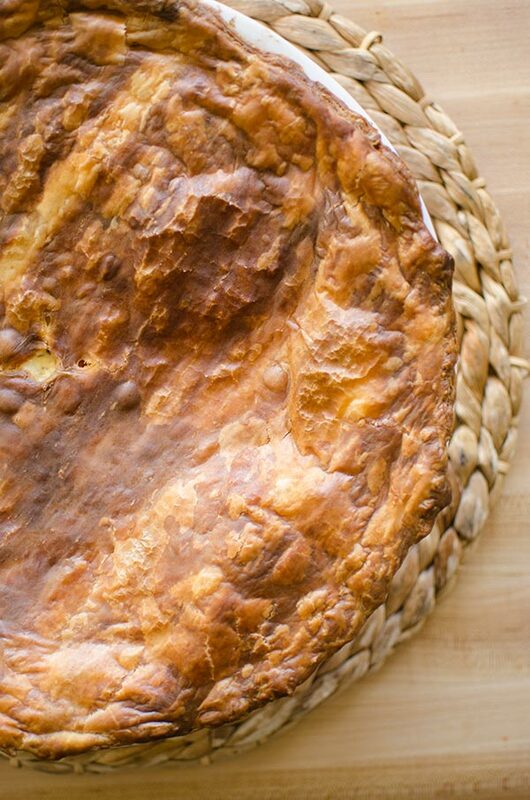 There is nothing worse than a pot pie with a runny filling, or a filling that splits! The trick is to cook the vegetables first, then remove them and dump them right into the pie plate along with the turkey and then to make your roux, which is equal parts butter and flour. The trick to making a perfect roux is to melt the butter completely and then add the flour in one addition, whisking the entire time to avoid lumps. You basically have to keep whisking the sauce so that it doesn’t get lumpy and doesn’t burn. It only takes about 6 minutes, but watch carefully. You keep whisking it for a couple of minutes to cook out the raw flour and then add your liquid in multiple additions. This mixture cooks down for about 6-7 minutes until it’s nice and thick. When you add the liquid mixture to the veggies and turkey, you’re going to think ‘There is no way there is enough liquid in here, this pot pie is going to be dry!’, but guys, do not panic. This is the consistency that you want! Preheat oven to 375F. Place leftover turkey or chicken in a standard sized pie plate, set aside. Heat 1 tbsp butter in a medium saute pan over medium heat. Add onion, carrots and parsnip and cook for 3 minutes. Add peas and 1/4 tsp of salt. Cook for another minute. Add vegetables to turkey in pie plate and wipe pan clean. Add remaining butter and melt. Add flour in one addition, whisking constantly, cook roux until smooth, about 2 minutes. Add broth in two additions, whisking constantly. Add half and half, continue to whisk. Cook liquid for 6-7 minutes, whisking constantly until thickened. Add dried thyme and remaining 1/4 tsp of salt. Cook for another minute. Pour liquid mixture over vegetables and stir to coat--it will seem like you need more liquid, but this will result in a creamy and delicious pie! Cover with puff pastry, trim excess from edges. Mark an X in the centre of the pie. Bake in the middle of the oven for 40-45 minutes. Cover with foil halfway through to avoid burning. 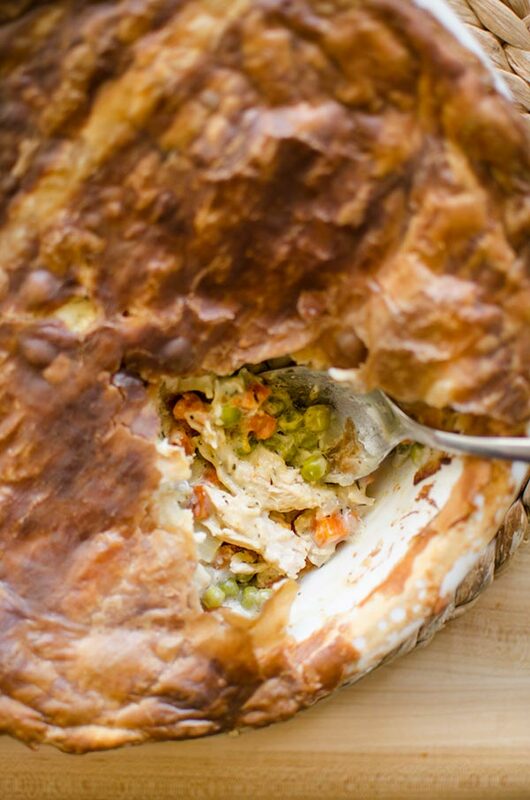 Let me know if you give this leftover turkey pot pie a try in the comments below. I can't wait to make this - perfect timing Louisa! This looks yummy!!! I usually like to prepare this pie , thanks for sharing !!! Thank you Aria, let me know how it goes!